1. 1. Preheat the oven to 450. 2. 2. Spray a cookie sheet with cooking spray, spread out asparagus and spray asparagus with cooking spray. Roast for 10 minutes until asparagus is crisp-tender. 3. 3. Combine remaining ingredients in a bowl and chill for 10 minutes. 4. 4. 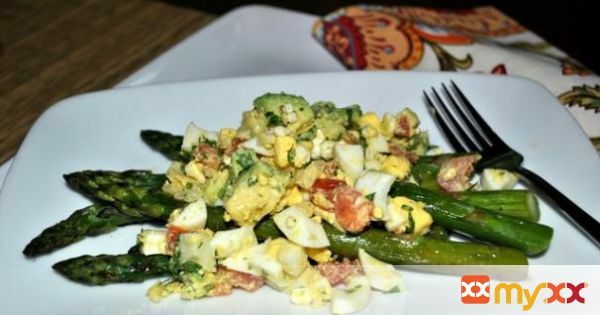 Serve salad on top of asparagus.